How much is Rik Smits Worth? Rik Smits Net Worth: Rik Smits is a retired Dutch professional basketball player who has a net worth of $18 million. Born in Eindhoven, Netherlands, in 1966, Rik Smits played college basketball at Marist College in New York from 1984 until 1988. He was twice named the NEC Player of the Year in back-to-back seasons in 1987 and again in 1988. The Indiana Pacers drafted Smits with the second overall pick during the first round of the 1988 NBA Draft. The seven-foot-four, 250-pound center played every game of his career as a member of the Pacers from 1988 until 2000. He made the NBA's All-Rookie first team in 1989 and was named an NBA All Star nearly a decade later in 1998. He finished his pro playing career with close to 13,000 total points to go along with 5,277 rebounds and 1,111 blocked shots. Smits averaged 14.8 points per contest in addition to 6.1 rebounds and 1.3 blocks. 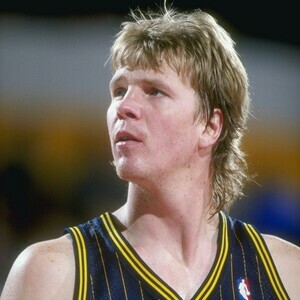 Smits played in 867 total regular season games and more than 100 postseason games with the Pacers between 1989 and 2000. Following Smits' official retirement from the league, he has become heavily involved in the collection and racing of vintage motorcycles used for motocross. He has been involved in competitive motocross with motorcycles for several years and has been profiled by Yahoo! Sports on the subject. Also after his retirement, Smits was chosen to the Pacers' 40th Anniversary Team.